View More In Tree Skirts - Page 11. •Measuring 40" x 40", this tree skirt is perfect for any sized Christmas tree. WORKS ON ANY TREE: Measuring 40 inches in diameter, this tree skirt is perfect for any size tree from small to very large trees. Also works as a great way to add authenticity to any synthetic tree's look and feel! 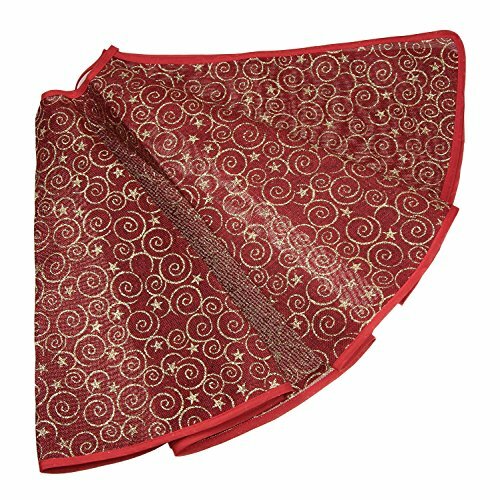 LOOKS GREAT: This dark red and gold burlap Christmas tree skirt features golden spirals and stars all throughout it in a beautiful design. NO HASSLE: This tree skirt is ready to go right out of the box without any hassle . Just tie it around the base of your Christmas tree and it's ready for presents and gifts!